Can a seafaring fairy godmother, a wise fool, and an enchanted hairstyle keep Princess Rose out of trouble? "A very long time ago, when all the countries you’ve ever heard of were in different places on the map, a princess was born who was not beautiful. She wasn’t even remotely pretty, and the whole kingdom was in deep shock about it." Princess Rose doesn’t get any prettier as she grows up, but the kingdom does get over its shock. Everyone adores the skinny, buck-toothed princess, and she doesn’t mind her appearance—until the handsomest prince in the world comes looking for a bride. Despite warnings from her seafaring fairy godmother and a wise fool named Jasper, reckless Rose wishes for beauty. She gets her wish, and the prince, but finds neither is as nice as she had expected. 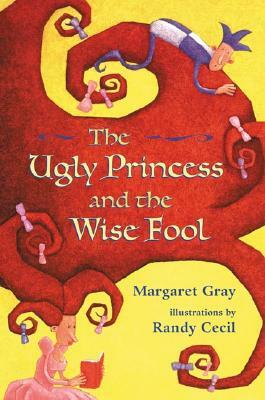 The Ugly Princess and the Wise Fool is a 2003 Bank Street - Best Children's Book of the Year. Margaret Gray started writing this story when she was a buck-toothed girl who read a lot of fairy tales. She lives in Los Angeles with her husband and their daughter. This is her first book. Randy Cecil has illustrated a number of children's books about spunky little girls, including "Dusty Locks and the Three Bears "and "Little Red Cowboy Hat." He lives in Houston, Texas.